Set slow-cooker to High. Line slow-cooker with parchment paper, up the sides of the slow-cooker bowl. Add flour, honey, baking powder, salt, olive oil and 1 tablespoon rosemary to a mixing bowl. Pour in beer and stir with a mixing spoon until just combined. Place a large paper towel over top of slow-cooker and then place lid on slow-cooker. Adding paper towel with help keep moisture off of the bread. Cook on High for 2 to 2 1/2 hours or until the center of the bread is fully cooked. Remove from the slow-cooker and let cool. 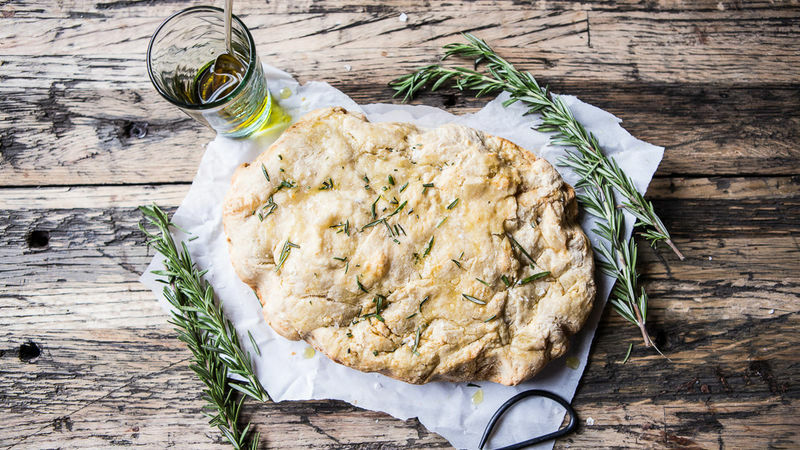 Drizzle with olive oil and sprinkle with the remaining tablespoon of fresh rosemary. Slice and enjoy! If you’re not a fan of rosemary, you can omit or swap it with Parmesan cheese and/or your favorite herb. You can also use butter in place of the olive oil. This loaf of bread can also be baked in a 375ºF oven in a loaf pan for 45-55 minutes.